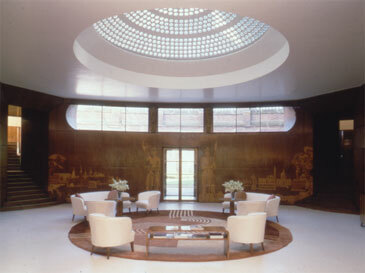 To the splendid opulence of Eltham Palace on Sunday, one of London's hidden jewels recently eulogised by Owen. Like Portmeirion, but in a very different way, the architectural palimpsest of Eltham Palace - 'a 1930s graft onto a 15th century Tudor pile' - is an example of sympathetic modernization. The 'deco rotunda', the 'rooms done in whichever historicist style currently favoured, in this case some ersatz Dutch and Italian bedrooms (with the telephones and radio speakers secreted in imaginative places)', were ostentatiously new - as Owen observes, 'the sinister ambience of the moderne' is everywhere in Eltham Palace - without being violent desecrations. In another apartment, not far away, in Kensington, he opened a wardrobe and found half a dozen pure silk Fortuny dresses that must have formerly been worth a few thousand pounds. They were not hung, but twisted and rolled into skeins to preserve their pleats. These were said to be so fine that one could pass them through a wedding ring, and as he lifted them, he marvelled at their lightness and the soft shining of their subtle colours in the dusty illumination from the windows. In this same apartment he came across photographs of the woman who must have worn these dresses as a young girl. 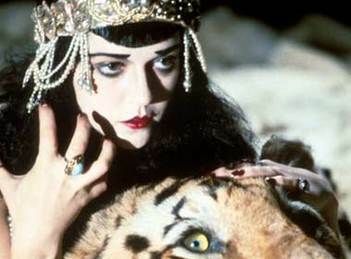 She was very slender and typically thirties in style - short hair, pale face, dark eyes and lips. 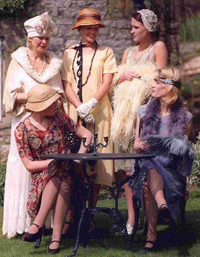 The photos showed her standing among her friends in the gardens and drawing rooms of the well-to-do through the years of changing fashions - the austerity of the forties, the grey fifties, and as a good-looking mature woman in the early sixties. After that there were no more photographs, though she must have lived in this apartment for long afterwards. 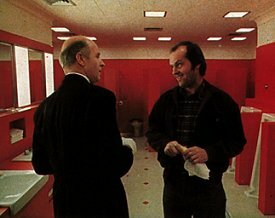 The nostalgia of The Shining, the longing for collectivity, takes the peculiar form of an obsession with the last period in which class consciousness is out in the open: even the motif of the manservant or valet expresses the desire for a vanished social heirarchy, which can no longer be gratified in the spurious multinational atmosphere in which Jack Nicholson is hired for a mere odd job by faceless organization men. This is clearly a "return of the repressed" with a vengeance: a Utopian impulse which scarcely lends itself to the usual complacent and edifying celebration, which finds its expression in the very snobbery and class consciousness we naively supposed it to threaten.